This is (was?) a working HP400F meter that had been sitting on the closet floor for a few years since its last use. The PC board traces are gold-plated. Ah, those were the days of $34/ounce gold. HP400F meter showing wet slug tantalum caps. Note the very old 1978 date code aluminum electrolytic caps and the wet slug tantalum caps. Upon power-up the meter did not respond to signal for about 30 minutes. Then, suddenly, it started working perfectly. As Paul pointed out in the entropy thread these meters will either be noisy or non-responsive until the wet slug caps have reformed. I try to leave mine on if I'm going to be using it and will be leaving this one on burn-in. The HP334A behaved exactly the same and then "woke up." I'll probably re-cap the 40 year-old aluminum electrolytics but the last time I checked this meter it didn't need it. I gold plated the PCB foil pattern for my conductive rubber switches in my first generation drum turner... that was a little over a decade ago... the second generation tuner used carbon ink... no real problems.. but I did have to tweak my code a little for the higher switch resistance... (i.e. turn off the current source pull up while scanning for presses). One of the two HP400GL’s is working. I pronounce the other one dead. It’s been on for almost two weeks and is still not functioning correctly. The dead one has a peeling meter face. I guess I should consider myself lucky that the one in good physical shape is the working one. I like that it is calibrated so that 0 on the meter scale is +4dBu. I’m almost always looking at the dB scale so having the voltage scale be incorrect isn’t a problem. The Waveforms 520A is calibrated normally. Save the second one for parts. You might find a dirt-cheap HP334 distortion analyzer that uses the same meter and put it in the '400. Also, you might be able to disassemble the peeling meter face, flip it over to the bare side and use that side for a custom meter scale someday. I've done that before and it worked out pretty well. The wet slug tantalums (the ones that work) cost about $20-50 each to replace. I seriously hope you find the Fluke 8060 you thought you may have thrown away. I have a trove of Leader LMV-series AC voltmeters. Two of the LMV-185A with "stereo" dual pointer meters and input amps. Those used to be pretty cheap on ebay. The LMV-181 is also a good meter. I tested all of the Leaders yesterday: All of them immediately worked correctly pointing "due North" at 0 dBv. Paul - I have a couple of the 60s era HP-400Hs with the big square Bakelite meters. Do you suppose someone would be interested in a unit with two of the bare HP meter movements racked-up with buffers for a steam-punk industrial-looking DW Fearn-style meter bridge? I realize the ballistics are all wrong but for checking alignment and for level setup they'd be very useful. I ask because I think the meters would be more valuable re-purposed than they would as a VTVM AC Voltmeters. I’ll save the broken 400 for now. I have to be ruthless in throwing stuff away because my space is so limited. I use the AP Portable One for almost everything. The only time I use the AC voltmeters is when I need a second measurement or I’m measuring somewhere between input and output. I think I’d want a real VU meter if I was going to bother with a meter panel. Maybe a microphone preamp? BTW I added a link to the HP400F/L manual in the original post. Send me a heads-up before you throw any test and measurement equipment away or anything with a mechanical meter or audio transformer. I'll pay postage. I'm with you on the Portable One. I don't use my AC voltmeter much for measurements below 0 dBu. A soundcard and AudioTester are light years ahead for most level and noise measurements below 20 kHz. For accurate in-band sub-dB level measurements the Fluke 8060 rules. Out-of-band or high level measurements make me reach for the HP400FL or Leaders. When I'm doing power amp burn-in I sure like having an AC Voltmeter reading the load voltage just to keep the load power below the dummy load's maximum. An extra meter is nice for that. One of the most common ways for me to use an AC voltmeter is to double check the iAudio Interface2 with the Studio Six Digital software. It's really designed for acoustic measurements. The In/Out ports can be software configured in a number of ways. Setting the waveform output level and the Input level can be confusing. I have a General Radio 1840A Power Output Meter. It is good up to 20W. It's a passive device. I don't do much with power amps. The main thing I use it for is to load the output of the VG66 power supply modules so I can calibrate them on the bench rather than crouching on the floor within extender card. There was a ton of test equipment at the lathe shop. Much of it was non functional and physically large. A lot of it got tossed as there were no takers. I saved six pieces. The Waveforms 520A AC Voltmerter, the General Radio 1840A, A KEMO SM3 Impedance meter, a Simpson 260 and a Weston micro ohm meter. Everything but the Simpson is a pretty unique piece. The KEMO is pretty cool. It has 16 selectable termination values and is lithium battery powered with an external charger. My old 400FL has had 2 mods I added many years ago, and it is a great tool. First I added a unity buffer to the Range Switch Output (before the meter circuit) to a BNC to be a full range linear output signal. This signal connects to the scope or spectrum analyzer. 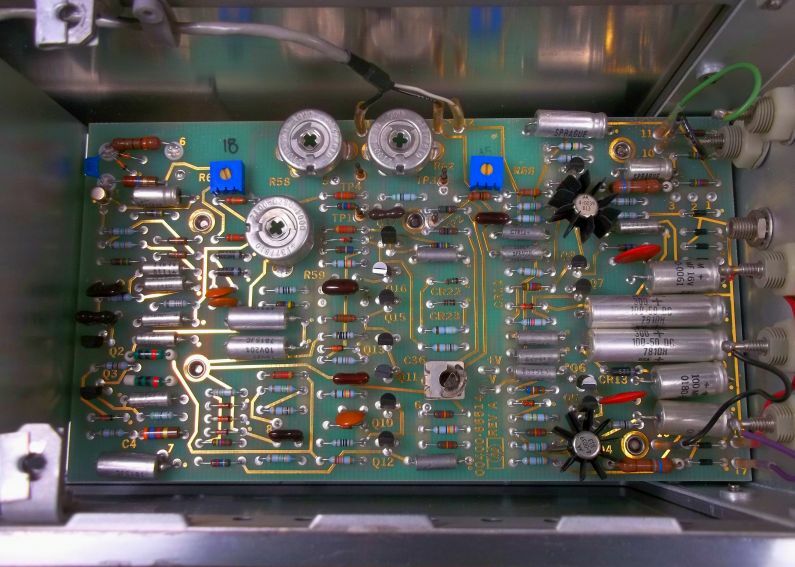 This mod removed the distortion from the rear output signal due to the METER RECTIFIER circuit. The second mod was adding another switch to change the BANDWIDTH to 400-500 Hz from 100 kHz for hunting down the AC LINE hum/harmonics. Was the sample point for your full-range linear out the commutator of S2 which is the input pin 9 of the Meter Amplifier? I've always wanted to move the single-pole filter down to 15.7(?) kHz for noise measurement. Using my way back machine, I used to feed the product output from my HeathKit distortion analyzer into the input of my old used (Singer) Spectrum analyzer... This combination extended my visibility into low level THD. I could actually see and measure the THD from the HeathKit audio path when running full level signal. I resolved that by running the HeathKit 10 dB below nominal 0dB, dropping its distortion down into the noise floor. I think I glanced at the HeathKit schematic looking for an obvious circuit improvement, and nothing jumped out.